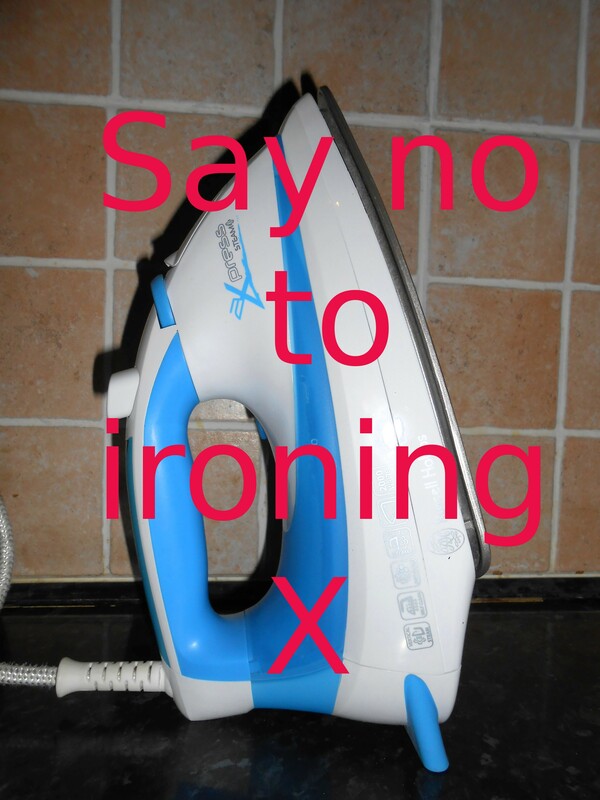 This week, I’ve had a revelation: not of a religious kind, but one related to ironing. You know how people can tell you something a million times over, but you don’t believe what they’re saying until the time is right? “Oh, I never bother ironing — what a waste of time,” they’d say to me. “Superior whatsits,” I’d think (and they’d probably be thinking the same, or feeling decidedly sorry for me). Well, that was all the permission I needed to stop ironing altogether. Take the washing out of the machine directly the cycle ends. Shake out the clothes before hanging on the clothes line. Peg the clothes inside out. Smooth the clothes into shape on the line. Fold them with care when you remove them from the line if they’re bone dry, otherwise air them on hangers indoors first. Simple, isn’t it? And what an easy way to earn yourselves two extra hours a week to write, blog, dance, sing, go for a walk in the country, or plain relax: whatever you fancy. Francina, you are a wise lady who, doubtless, has already saved many valuable hours by being careful not to iron too much! Preaching to the converted Sarah!! I can honestly say I have not touched an iron, other than to move it around in my linen cupboard, for a good five or six years. And if I one day find a man worth knowing, and he needs anything ironed, I’ll teach him to do it himself!!! Funny thing about this particular post of mine — my husband usually likes my posts, but this time he complained it was too long and pointed out to me that there are still some things that require ironing e.g. shirts, so the collars sit right. Humph D: Sewing on buttons is quite enough (I feel another post coming on about sewing!). I do a couple of pleated skirts and school shirts a week. That is more than enough. The dreaded pleated skirts — I remember them well! There is something quite therapeutic about ironing pleats. Ahhh – I could be a bunny with a ‘special’ secret! I first read this comment from the email on my phone, so completely missed out on the humour here, although it does still bear relationship to my novel: not the title, as suggested in my email to you earlier, but to something of importance in the story! I could imagine they weren’t. Very amusing. I had build a synthesizer at primary school and I remember the teachers asking me how it worked. I didn’t understand their disapproval at my lies – clumsy little ten year olds don’t build that kind of thing. So I explained Schmitt Triggers to them with diagrams. That story of yours just about illustrates my experience of school, but well done to you sorting the teachers out with your diagrams. I remember having an argument with a teacher who marked my correct answer in maths with a cross because my workings out didn’t fit the standard (even though my way was quicker and worked for all the sums of that type). No wonder I went off maths. Then there was my son, who wrote an amazing story for a national competition when he was six, which I’d typed up for him (as dictated and without corrections). On the critique that came back with it, the judge said that his language and sentence structure was far too mature for a child of that age, so it must have been written by an adult. Grrrr. He was so pissed off. Fortunately, that same year, he won the school prize for creative writing, so on that occasion, the school came up trumps. P.S. You see my difficulty with getting Anna’s eight-year-old voice right in my novel. It has run in my family to be two or three years ahead with our language skills at that age. I can indeed understand your problem. PS. You didn’t perchance talk to your son instead of dumping him in front of the dumbing-down-box for hours at a time. We talked, played imaginary games, I read to him for about an hour a day, and we only watched television together, switching it on for favourite programmes (usually ones that had books to go with them, too, i.e. Spot the Dog and Sesame Street). He also collected David Attenborough videos, as well as Dr Who ones, which he played until he wore out! Of course, we spent a lot of time outside, too, going for walks and visiting animal sanctuaries and collecting all sorts of things like feathers, stones, pine cones etc. It was a magical time for both of us. It does sound amazing. My time with Amélie was equally magical. It’s gone but I have it stored away in words and pictures and my memory. I hope you’re being allowed your fair share of time with her still. Oh yes – I get to pick her up every day after school. We do lots of stuff. I found you through oss at Crowing Crone. I like your attitude re ironing ironing. I have the same. Provided you fold the washing as soon as it comes off the line, no need to iron. My daughter taught me this. I am currently in Florence having just spent 5 weeks in the UK with my sister. Where are you in the UK? It’s funny how often one’s offspring have something practical to teach us! I live in the South East of England in a seaside town along the coast from Brighton.